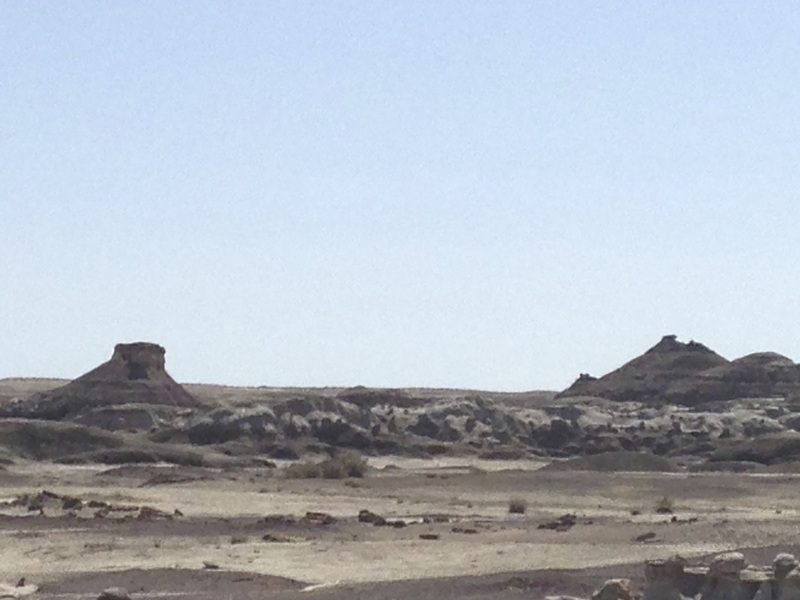 This is a simple, four-hour hike (including breaks), covering six meandering miles or so, to the most commonly visited parts of the western end of Bisti/De-Na-Zin Wilderness,which I will call "Bisti." The wash floor is basically a natural cinder track that is easy on the joints. From the parking lot to the eastern end of the hike, elevation change is probably 50 feet. To get the most out of this hike, read the other pages here. If you have a GPS device, the directions are simple. I provide photos to help identify landmarks for those without GPS equipment, and suggest you bring a compass. This hike proceeds just a hair north of due East from the parking lot, along the southern side of the broad wash floor. From the gate in the barrier fence east of the parking lot, look due east for a red hill with two tops. It is very easy to see. 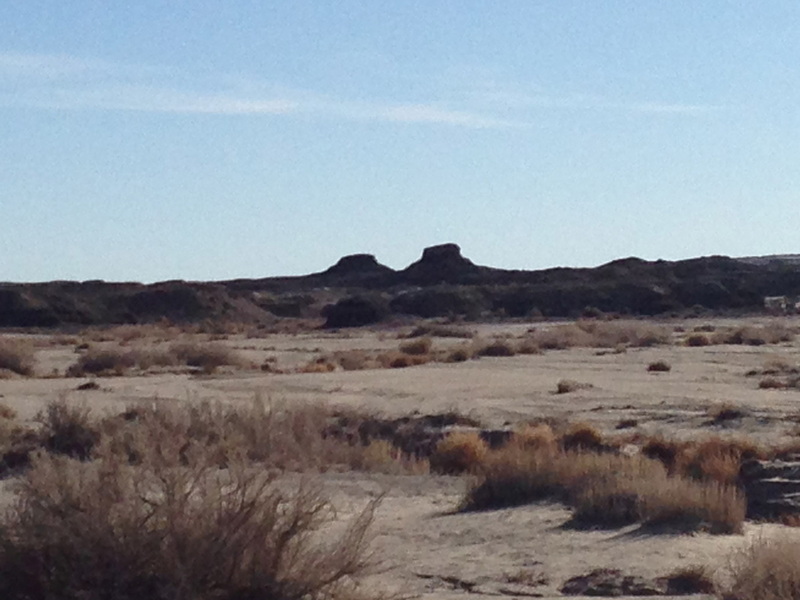 It stands off by itself away to the south (right) of most of the red mounds you can see at the trailhead. The GPS coordinates above are for the spot where the boy is standing. 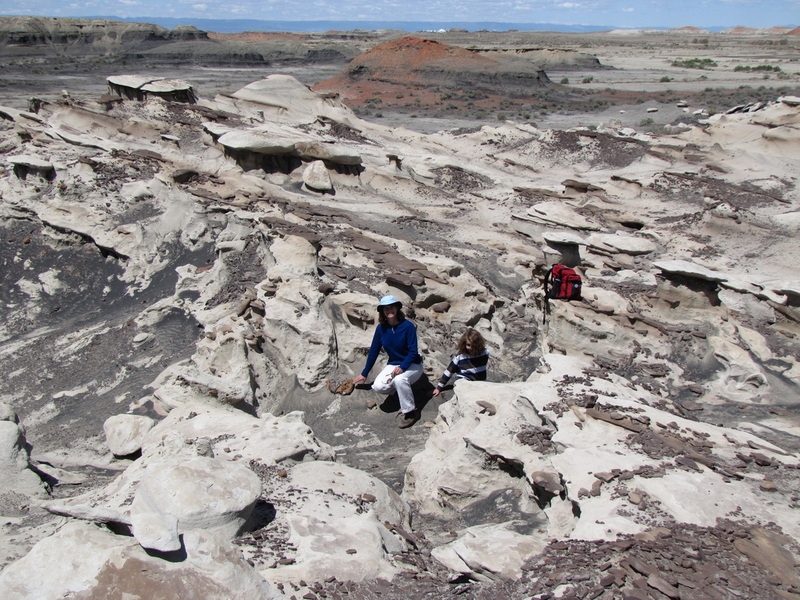 Climb up there - it's quite easy and you will be able to see the field of hoodoos to the south of the hill. Note the little pieces of baked red sandstone, called "clinkers." See the geology pages for more on those. Proceed east from the red hill. Use your judgment on the route. You can climb up on the outcrops if you want to keep longer lines of sight - it takes just a little bravery to run down the steep slopes. 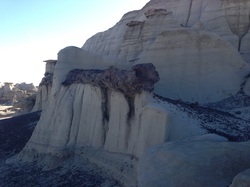 Or you can veer slightly north around the obstacles to stay on the broad flats that form the bottom of the Bisti area. Either way, directly to the east is a double-capped black hill with very flat peaks, very visible from the red hilltop. You will easily see the next few features if you head directly to the black peaks, aiming for their northern (left) slope. 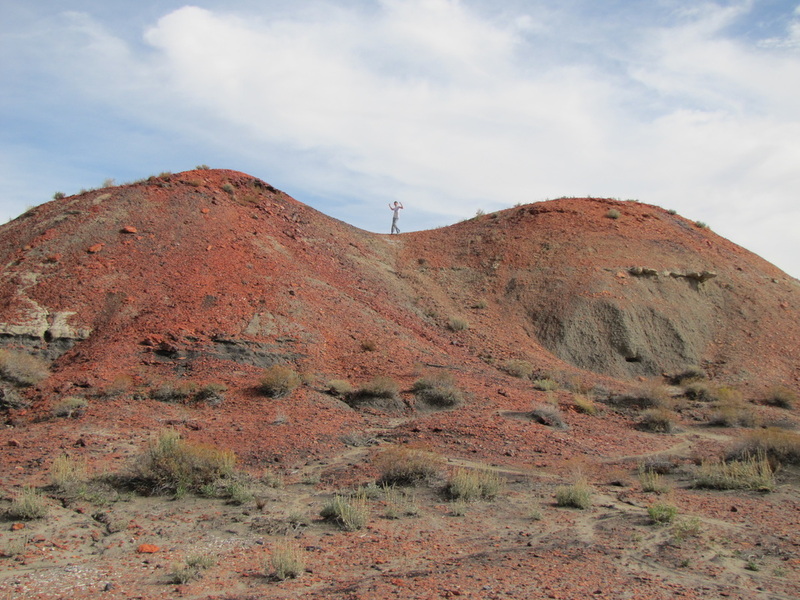 This low red rise is made up of red clinkers on top of black lignite. If you walk to the north side of the hill, you can see clamshell bits eroding out of the lignite. They still feel and look like little bits of freshwater clamshell. The clam shells mix with bits of petrified wood - the wood is less bright white and feels like sandstone. (See geology pages for details on clinkers, petrified wood, and clam shells ) . 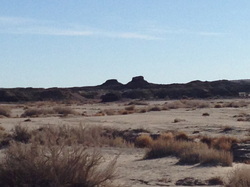 This same rise is visible in the background of the first picture in this series, taken from farther east and looking across the site pictured below. 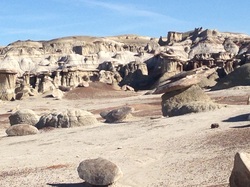 Walking again due east toward that black flat-topped double hill, you come to a broad flat area with many low hoodoos. The first photo introducing this hike is a view looking west across this area, back at the lignite mound above. The features here include "wings" - weathered by wind into unusual saddle shapes. From here head straight for the north side of those two flat black hills. I reached the area in a little less than an hour, when I was making notes for this hike. This is the silhouette of the flat black hill, as seen looking east, roughly from the red hill. The twin tops are distinctive and poke up slightly above the horizon as you approach from the west. Just past the black hill, there are many unique sights. I don't know why the parking lot is a mile west of here. 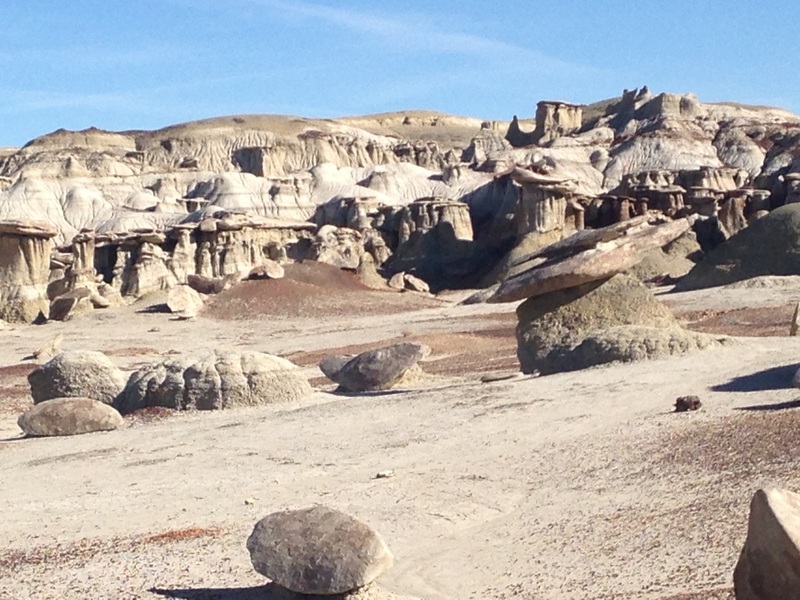 This nest of hoodoos is one for geology fans. Most of Bisti was river delta, but here is preserved a record of the stream going through, changing directions, depositing ash willy-nilly. The sedimentary layers are not level and reflect many changes in the course of the stream. The BLM paleontologist who showed it to me was absolutely thrilled with it. Most of my friends have been more interested in the petrified wood to the east. 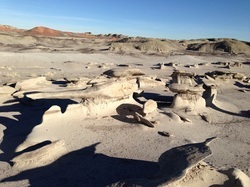 The best-documented feature of Bisti is the Nursery. BLM's map calls it "Cracked Eggs." These are remnants of limestone tubes that built up, as water carved channels through the volcanic ash. The limestone is harder than the ashy clay, so the tubes now lie on the floor of the wash, eroding into egg shapes. There are many nicer photos of the Nursery online. This is how they look from a distance - like rounded rubble. I walked by these lumps on the wash floor several times before getting close enough to see their elegance. 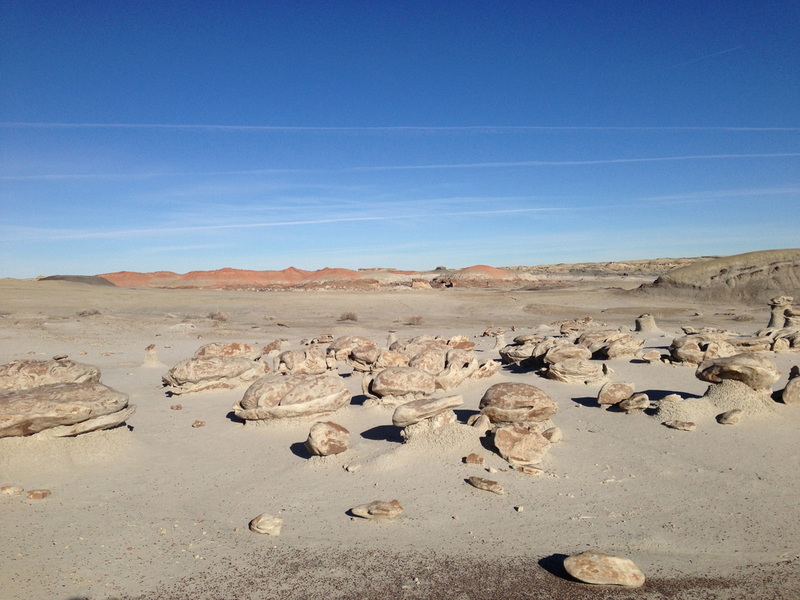 The densest collection of things to see in Bisti is within 1/4 mile walk of the Nursery. 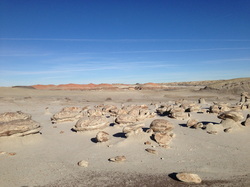 The first big chunk of petrified wood is east of the Nursery, around two small outcrops of ashy rock that run out from the southern wall of the badlands. It is a large trunk that looks like a black smear on the third outcrop's face. Most petrified wood in Bisti is not agatized and tends to be somewhere between pale tan and medium brown. This log is unusually dark. A BLM employee told me it is pine. 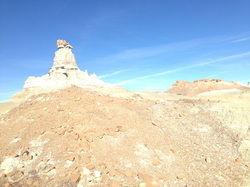 If you climb over that outcrop behind the petrified log in the photo above, you will be in a circular depression, about 500 feet in diameter, bounded by rock walls. I call it the "alcove." To get there more easily, continue east of the above petrified log and look for a way to climb over the southern wall. There are several paths. Within 200 yards, the wall ends and you can simply backtrack into the alcove without climbing. Once any member of your group is inside the alcove, several easy ways in and out are immediately apparent. 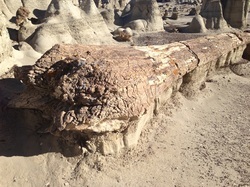 Within this area are several large pieces of petrified wood, including this huge cypress with some of the root bole still visible. It is worth walking around to see what else you find. Continue east from the amphitheater - just walk out its eastern side - to a large butte with a richer brown siltstone cap. (Siltstone is rich brown and stands out - see geology pages). This photo is taken from the siltstone wall, a few paragraphs below, but it is pretty much what the high cap looks like. 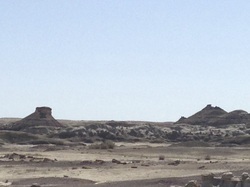 The butte juts above the horizon from almost anywhere east of the black hill in Bisti. This is the only time you will enter a space that constrains your lines of sight. Go along the south (right) side of the butte and follow the wash east into a bit of a canyon. There are polished pebbles on the floor of the wash, carried here by the glaciers as they melted in the last ice age. (See geology pages.) 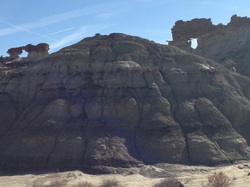 The erosion patterns on the south wall of the butte are cool, as are the hoodoos. Keep going east along the wash that hugs the south side of the butte until you see the view in the next picture. 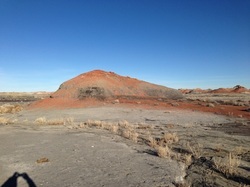 There is a hawks' nest on the southern side of this little cap, east of the big siltstone-capped butte. 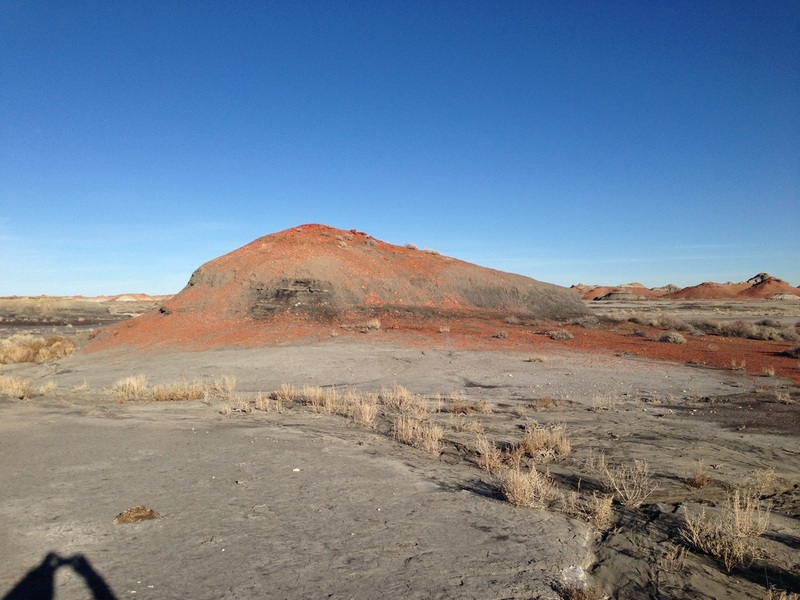 It was abandoned in 2007, the BLM biologist told me, but it is cool to imagine those starving hawks hunting for the scarce cottontail rabbits of the Bisti. The GPS coordinates above mark the passage from the south side of these siltstone-capped buttes to the main wash area again. You can see the point where the shadow of the little butte cuts off - that's the passage. Head north from there. Going through the passage may be disorienting. I promise you will quickly recognize where you are. Once you get to the north side of the passage and look left (west), you will see familiar features. As you first see it from the south on this route, the Red Queen really does look like a chess piece. Up close and from the eastern side (photo), it gets squatter. It stands south of what I think is the best field of hoodoos in the Wilderness. From the Red Queen's feet, you can look north into a dense area of hoodoos that are topped both by limestone and siltstone. It is worth wandering around and looking. 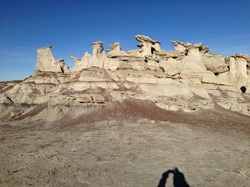 The distributive channel sandstone that forms the caps of the hoodoos is quite wide and thick. The pillars are taller than most. 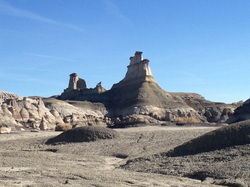 The hoodoos with brown siltstone caps are the tallest standing stones in Bisti. 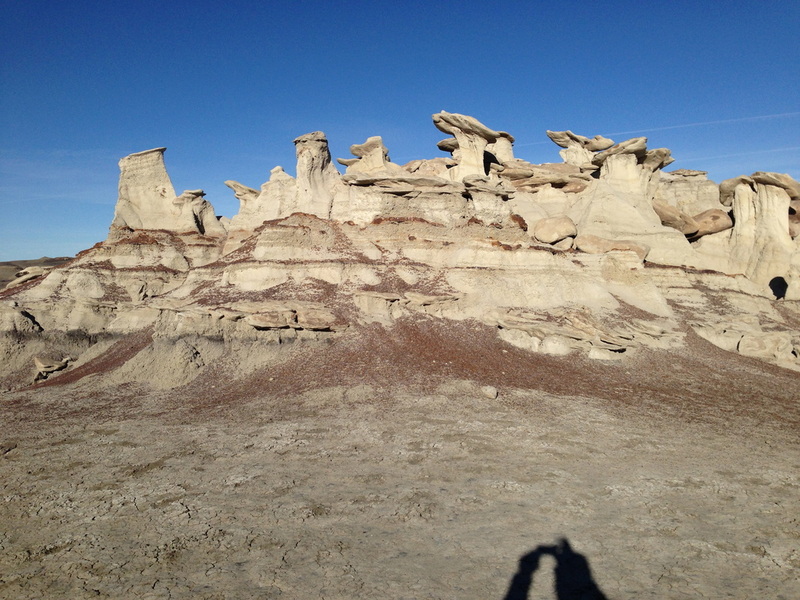 It takes about two hours to get to this field of hoodoos, with stops. The way back is probably a little faster. The hike now begins to return west, toward the parking lot. I saved a couple of sights for the walk back. It is 20 minutes walk west from those easternmost hoodoos, to a siltstone wall with two breaks in it. You will likely see it from the Nursery as you go east - it is about 750 feet NNW of the Nursery, and worth visiting on your way back. If you want to shorten your walk, as I indicated above, skip the eastern hoodoos and the hawk's nest, and go directly to this feature. I generally take about an hour to get from the parking lot to this feature. As you can tell from the GPS coordinates, the Arch is a few steps southwest of the siltstone wall. It stands in what looks like a pile of brown rubble on the south end of the wall, and is just out of the frame in the picture just above, left. The opening of the Arch is perhaps 12 inches high and three feet long, and the top of the arch is waist high when looking east, as in the picture here. From the east side, looking west, the aperture of the Arch is practically at ground level and the top is knee-high. I spent a lot of time looking for this tiny feature, walking by it many times because I expected something impressive. I would say it is less an arch than a window. 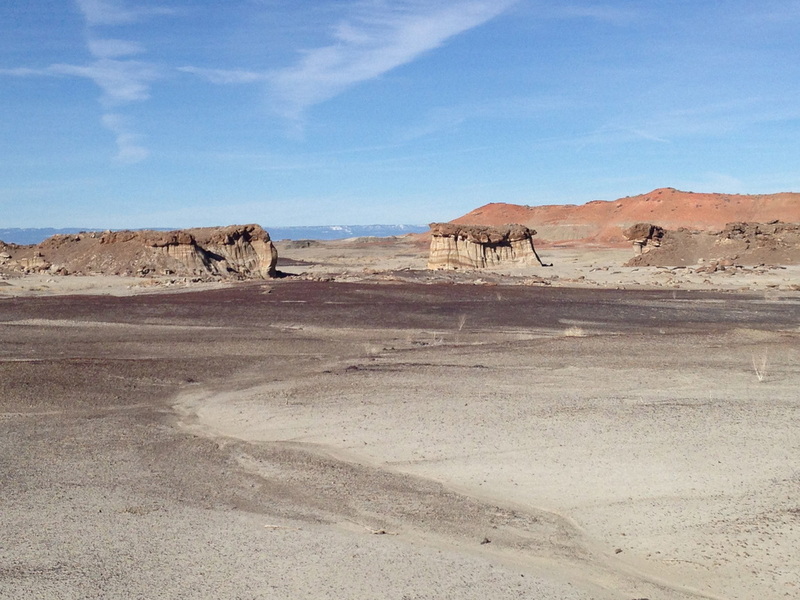 As you can see, there are two features where the siltstone forms a top across decaying sandstone below. They are more impressive than the arch. The one on the right reminds me of a window that is featured on the Point Imperial road along the north rim of the Grand Canyon. 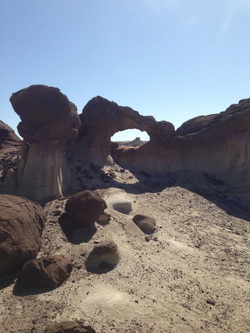 Smaller, of course, but not a miniature like the Bisti Arch. It is about 10 minutes walk north and a bit west from the wall to this feature. There is a narrow field of view for the windows, at least from the western side. That low mound immediately in the way makes them hard to find. There may be better viewing angles. If you need to keep the 4-hour schedule, or have small kids, I recommend more or less retracing your steps from the windows along the wash bottom to the siltstone wall, then to the black flat-top hill, then to the red hill and finally to the parking lot. But as long as you are heading generally west, you'll reach the access road eventually. It is almost impossible to get really lost in Bisti. If you ever get disoriented, climb a rise and you will quickly see familiar features. Do keep an eye out for sinkholes if you wander - they can catch your foot and twist your ankle. If you have some time and feel like scrambling up and down hills, proceed WNW from the Windows, and you will see some rich fields of hoodoos and walls of siltstone. Check out the BLM map for the area marked "Alice," which I have also heard referred to as Wonderland. 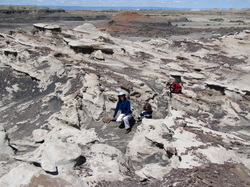 The nearby area also includes some large exposed fossil bones. Eventually you will reach the limit markers on the western side of the Wilderness. Follow them north to the spot marked "Bisti Arch" in error (there are no arches on that end, but some great hoodoos) and back due south until the fenceline turns west. You will see the red hill at that point and probably the parking lot, too. The lines of sight are quite good at the fenceline.